Mr. Edwin Oyler, Superintendent of Todd County School District, was honored to award Mr. Robert Henry (Sonny) Newcomb of Trenton, Kentucky, now a resident of Hearthstone Nursing and Rehab Center, his high school diploma on Monday, August 27. The diploma was presented by Mr. Oyler on behalf of Todd County Board of Education. Mr. Sonny Newcomb was born August 27, 1939. He has been married to Goldie Spry Newcomb for 60 years. 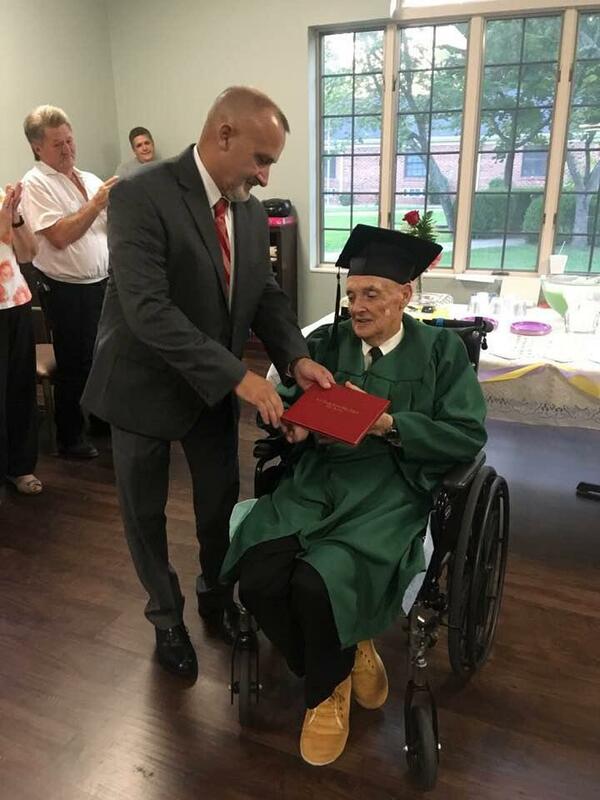 To celebrate his 79th birthday, he was awarded his high school diploma at Hearthstone Place surrounded by his wife, daughter; Beth Boyd and husband Eddie, granddaughter; Jennifer Mann Miller and husband Shane, and great-grandchildren; Everett and Lizzie Miller. Others in attendance were nieces, nephews, close friends, family, and staff members of Hearthstone. Mr. Newcomb was a member of the Trenton High School class of 1957.